West Side Story is one of the greatest musicals ever. 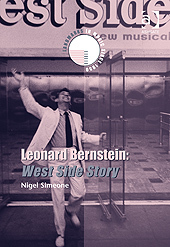 Composer Leonard Bernstein easily matches the very best of Oscar and Hammerstein musicals with songs such as Maria, Tonight and Somewhere, but the inclusion of gang music with an edge and terrific latin numbers and orchestral interludes brings the whole experience to a level which has never been exceeded. 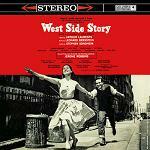 In fact, several decades later, West Side Story is so popular that it has its own web-site at www.westsidestory.com. The story is based upon Romeo and Juliet with the Montague and Capulet families replaced by rival gangs, the Jets and Sharks, in New York's West Side. The Jets are white immigrants and the Sharks' members are Puerto Ricans, and this background is still totally relevant to the racial tensions in many big cities throughout the modern world. One of the particular hallmarks of this musical which raises it above others in the genre is that all the key components fit together so perfectly. Bernstein's music, the lyrics from Stephen Sondheim and the choreography from Jerome Robbins are so well integrated and complementary that it's as if the three great artists thought as one. The lyrics bring out all the longing of the central pair in love, they also emphasise the street-smart language of the West Side residents with cynical, teasing numbers like "America" and "Gee, Officer Krupke" bringing out racial and social issues. Sondheim frequently suggests swear words but wisely uses soundalike substitutes to get the ambience across without alienating his audience. The pacing and order of the songs is also perfectly judged, and even better than the stage version by swapping "Gee, Officer Krupke" and "Cool" into more natural positions. The Overture is an orchestral introduction, immediately establishing the key themes and moods of doomed romance in the midst of conflict. The Prologue starts eerily with whistled notes breaking the urban silence, then joined by macho finger snaps before the percussive musical fragments and syncopations expose the underlying gang tensions, which are then underlined by the Jet Song which establishes the gang loyalties. Something's Coming is Tony's introduction and shows that he's ready for love. The Dance at the Gym is a chance for lots of dancing accompanied by brash and noisy latin-style orchestral material (including sections marked "Blues", "Promenade/Passo Doble", "Mambo", "Cha-cha" and "Jump") and, in the middle of this foot-tapping core, Tony and Maria meet as though completely oblivious to the others in the hall. Maria is Tony in love, and has frequently been used as a solo number with many cover versions. In America the Puerto Ricans dance while wittily debating the pros and cons of life in their adopted country to latin cross-rhythms in this "Tempo di Huapango". Tonight is another staple for cover versions and sees Tony and Maria consolidating their secret relationship with the Romeo and Juliet balcony scene transfered to the fire-escape of a tenament block. Gee, Officer Krupke is one of the best numbers in the whole show and is due largely to the bitingly relevant lyrics from Sondheim. The music for this Vaudeville routine rises by a semitone each verse. In I Feel Pretty Maria can't contain her feelings, while the other girls in the bridal shop gently tease her recognising the synptoms and insanity which springs from her love. One Hand, One Heart is full of tender sadness where Maria and Tony wish their situation were different so that they could marry and be together. Quintet is so-called because five groups or individuals are looking forward to "tonight" where they meet either in love or conflict. The five are the Jet and Shark gangs, Tony, Maria and Anita. (Anita is going out that evening with her boyfriend Bernardo, who is both the leader of the Sharks and Maria's brother.) The music cleverly mixes the five songs in a single climax-building number, the film able to cut between the participants more easily than stage productions. The Rumble is the gang fight during which Bernardo kills the Jet leader Riff and is in turn killed in anger by Tony, Riff's friend. Somewhere is an emotional duet where Maria and Tony desperately wish they could turn back the clock and escape from their predicament, while in Cool the now leaderless Jet gang members try not to panic. This number has a central orchestral fugue whose theme includes all 12 musical tones. In A Boy Like That Anita tells Maria that she can't trust Tony, but Maria sings of her continuing love in I Have a Love and wins Anita's acceptance. The story ends tragically in the bitonal Finale when, in a sequence of events replaying the classic Romeo and Juliet story, Tony is shot dead by a Shark member before Tony and Maria can execute their planned escape. The End Credits start sadly, rounding off the emotional tragedy of the story while summarising some of its key themes. It is still possible to get the original soundtrack recording which misses a few tracks (restricted by the capacity of a single LP), but it is the latest version of the soundtrack on CD with a running time of 77 and a half minutes (labelled as containing "previously unreleased material") which is recommended. Within the musical numbers there are short sections of dialogue, and the accompanying booklet provides background information on the musical's conception and the film's cast including a number of photographs from key scenes. This version is available at the following sites: Amazon.co.uk and Amazon.com. For a different take on the musical, the original cast recording is also available. The 50th anniversary remaster edition, including extra tracks not included on its first release, is available at these links: Amazon.co.uk and Amazon.com. Recently a book has been published which looks in depth at how West Side Story came together, specifically the Broadway Show with a chapter looking at the original cast recording. The book looks at the contributions of all the creative artists involved in creating the show - Jerome Robbins (choreographer), Leonard Bernstein (composer), Stephen Sondheim (lyricist), Arthur Laurents (director), Sid Ramin and Irwin Kostal (orchestrators) - and how their creativity influenced and inspired each other. These people clearly had different skills, backgrounds, expectations and temperaments, and yet they created one of the most enduring and iconic Broadway shows ever. The book is by Nigel Simeone, published by Ashgate, and is available at: Amazon.co.uk and Amazon.com.